“ There are places from which emanate a special poetry and magic. Properties in which nature and the work of man have so shaped the landscape that time there seems to stand still. As if it was inviting the visitor to make the most of the tranquillity and beauty of the place. Calon Ségur, whose wine-growing history dates back to the 12th century, is most certainly one of those places. What catches your eye as you near the château is the vineyard enclosure. Stone walls gently marking the contours of the plots and the land relief stretch over a quarter of a mile, protecting within them the estate’s legendary discretion and preserving the sense of eternity that appears to reign. 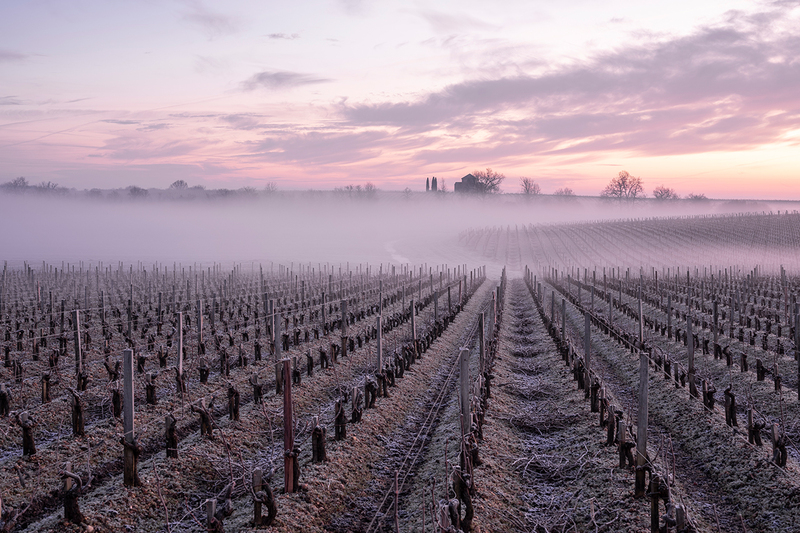 Watered from the north by the strong, calm Gironde estuary, the vineyard is located adjacent to the village of Saint-Estèphe and covers fifty-five hectares (136 acres) in one single block. It stands exactly as it did in 1855, when the official classification of the wines of Bordeaux was drawn up at the Paris Universal Exhibition. What better example of how history has respected this unique estate? On both sides of the estate’s main drive, the estate’s vine-growers have traced their rows with geometrical precision, elegantly extending, as in a garden à la française, the Chartreuse’s strict lines of perspective. Here, the château, the buildings and terraces conform to a classical design, barely enriched or smoothed by time. A mark of elegance and of sober, subtle refinement. A perfect balance appears, bringing refinement into sobriety, keeping a certain haugthy yet warm austerity. The estate is one of the oldest in the Médoc. 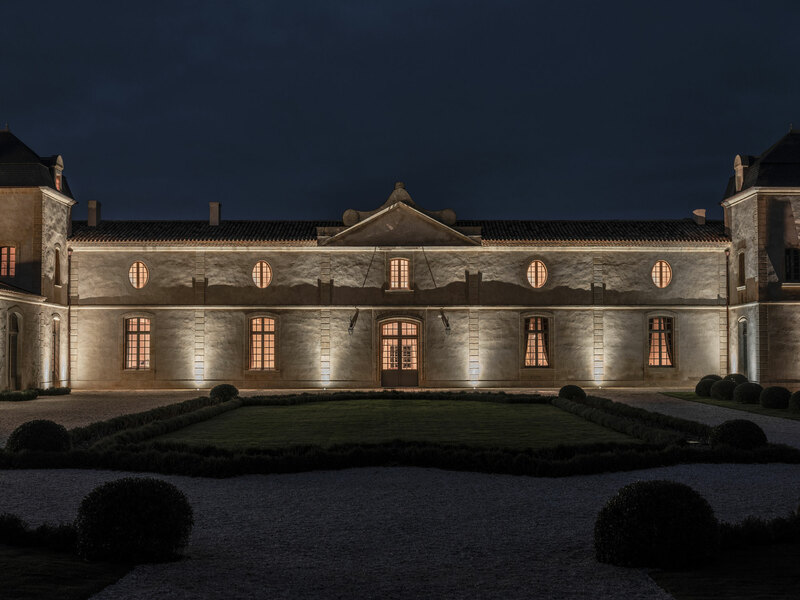 It prides itself on having had among its successive owners since the 12th century, Nicolas-Alexandre Marquis de Ségur, whom Louis XV nicknamed the Prince of Vines and who bequeathed much more to the estate than just his name. He placed it forever in that small circle of wine estates that are inseparable from their appellation. the superb potential of the property. These works, and the manner in which it was carried out, ensured that Calon Ségur’s image of discretion and its wonderfully rich history would be treated with the greatest care. With this aim therefore, we took on the top consultants and brought together a highlyskilled team. Men and women recognised for their great savoir-faire and their rigorous standards. Immediately, each of them was excited by the project and fell under the special charm of this unique, almost timeless place. In the creation of a new wine production facility and viticulture station, the refurbishing of the first year cellar and the building of a new vat room designed in the shape of arcs of a circle, we sought to equip the estate with tools that met the demanding requirements and specifications for the production of an outstanding wine. The works, which took place under the supervision of the architect Alain de La Ville and in close collaboration with the production team, enabled the creation of a modern, very functional work environment, faithful to the original spirit of the village of Calon. The restoration of the Chartreuse was entrusted to Anne Derasse, a Belgian interior architect, who benefited from the precious contributions of Alain de la Ville. The project that she designed and carried out with her customary sense of perfection and passion, sought to bring out the purity of the original 18th century form with designs that combined elements of the epoch with more contemporary additions, while always respecting the sobriety of the place. Particular attention was given to defining the atmospheres, to the choice of materials, colours and furniture items as well as to the harmony and aesthetics of the works, such as the Chartreuse’s reception rooms and the staircase leading to the First Year cellar through a protective casing made from a wooden vat, itself steeped in history. At Calon Ségur, as at all outstanding estates, the notions of domaine and wine are inextricably linked. Both of them, and together, express one and the same terroir; one and the same authenticity. Here too, we were careful to call on exponents of the art of winegrowing that would enhance the development of the vineyard and allow it to express its identity fully. Made head of the estate in 2013, Laurent Dufau is an exceptional, fine connoisseur of classified growth wines. Born and bred in the Médoc and the grandson of a vine-grower, he has a perfect understanding of the wine world’s inner workings and rules and has built up a relationship with the Bordeaux négociant market of hopefully mutual trust that has borne its fruit. Vincent Millet had cut short his science studies to take up oenology -his true passion. Since 2006, he has been Calon Ségur’s estate manager, undertaking painstaking work geared towards long-term objectives, both in the vines and in the vat room and cellars, guided by his innate search for excellence and sense of rigour. Both Laurent and Vincent took very little time to make their mark. Under their leadership, and with the close collaboration today of a 50-strong team working all year round at the estate, an ambitious vineyard restructuring programme has been undertaken. This will continue through till 2032 and will enable the Cabernet Sauvignon, the backbone of Calon Ségur, to eventually make up 70% of the vineyard. This multi-dimensional, long-term project has perhaps also been made possible through our belief as owners in working for the long-term. Throughout their history, and at each stage of their development, the Arkéa group and its Suravenir subsidiary, which owns the property, have invested in long-term projects and cultivated a special relationship with time, which has made them into “patient investors”. This particular way of working, which differs from certain economic models, resonates with a very special chord in the wine world, in which only time and its work enable the subtlety and richness of a terroir to shine through. After a period of almost six years of works, the estate will now open its doors to the world’s wine professionals. Wine lovers will be able to come and discover the three wines of the estate, each of which has its own individual personality. Château Calon Ségur, the grand vin, is a mirror image of the estate. Rare and moving to taste, it embodies that delicate balance between gentleness and intensity. It concentrates all our attention. Ready to drink sooner, the Marquis de Calon Ségur, the estate’s second wine, offers more immediate enjoyment and a silky mouth-feel, while at the same time recalling its illustrious superior. The third wine, Le Saint-Estèphe de Calon Ségur, is mostly produced from the estate’s young vines and shows a fresh, fruity and dynamic character. The family resemblance in these three wines is clear when tasting them on the palate, and it is articulated in a new set of labels redesigned in 2013. Displaying a variety of graphics that mirror the individual style of the wines, each of the labels now bears a heart. This heart, which has been the symbol of the Calon Ségur estate since the 18th century, echoes the famous words of the Marquis de Ségur, who said that he “made wine at Lafite and Latour” but considered “his heart was at Calon”. This historic link between the heart and Calon takes on a special meaning for a Finistère man like me. In the Breton language, heart is “kalon”. And since the days of the French philosopher Blaise Pascal, it has been a well-known fact that “the heart has its reasons of which reason knows nothing” when heart and reason come together, as is the case here, it can only be the start of a wonderful long story and a form of renaissance."